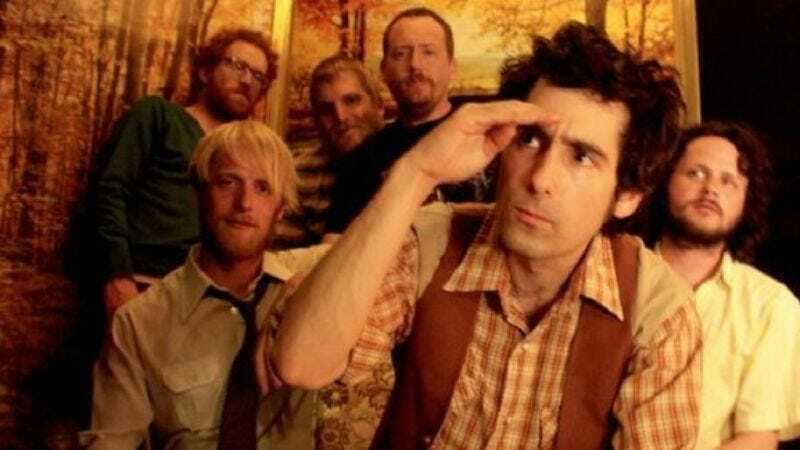 Portland’s Blitzen Trapper runs six deep when it comes to town, but the rambling Americana heart of this rather eclectic band is singer and songwriter Eric Earley. When 2007’s self-released Wild Mountain Nation dropped, the album was praised for its glut of good ideas—a wildly varying amalgam of Pavement slouch, hard-rock riffage, Southern hoedown, and Beck-like pop weirdness. Earley himself is almost as colorful, though coolly composed, which is actually a near-perfect way to describe Blitzen’s most recent album, Furr. The consistency of the band’s musical soup seems to thicken with time, and Furr finds Earley honing both that and a Dylan-esque lyricism. In advance of Blitzen Trapper’s performance at Ottobar in Baltimore this Saturday night, Earley spoke to The A.V. Club about his next record and biting Mr. Zimmerman’s steez. The A.V. Club: Your music, in sound and subject matter, has a distinct Americana bent. Do you attribute that to the influence of your father, a bluegrass musician? Eric Earley: Yeah, I gleaned a lot from him, everything from the records he liked to his love of Oregon. He grew up in Los Angeles, so he had the appreciation of having moved from the big city to a less populated region. I think a lot of our music is particular to the Northwestern landscape. AVC: Moreover, Blitzen Trapper seems to represent a broader, classic American-ness. Is that something you see as being part of the band’s identity? EE: Well, I think it’d be foolish to try to escape that. As in any art form, where you’re from has a lot to do with what you produce. There’s a very oral aspect within any culture, and oftentimes I feel modern pop forgets that, or pushes it to the wayside. I have some more typical love songs in my repertoire, but I write a lot of story-based songs. The new record I’ve been making is far more narrative than Furr. AVC: What you can say about the sound of the next record? EE: It’s even a little more consistent than Furr was. There’s not a whole lot of country, but there’s definitely a lot of American soul music going on. There are a lot of keyboards too. It harkens back to the Wild Mountain Nation days when I was using a lot of electronic stuff in the midst of these very organic-sounding things. AVC: Was that musical consistency something that you sought out? EE: No. And honestly, I think in terms of most bands, it’s not that consistent—it’s just in my own head. [Laughs.] The music goes from hard rock to really minimal folk, which isn’t super-typical in this day and age. But if you think back toward The Beatles, or even Led Zeppelin, they did that all the time. I think bands like Dr. Dog do that too. AVC: You’ve said that “Black River Killer” was inspired, in part, by the work of Cormac McCarthy. Does literature have a heavy influence on your songwriting? EE: It probably has the heaviest influence, even more than music as far as imagery and overall feeling goes. Music is more than just sound, and it’s very important to me to get right the same kind of feeling you get when you read Hemingway’s dialogue, McCarthy’s narrative, or the detail in a Flannery O’Connor story. AVC: Your lyrics and delivery often draw Bob Dylan comparisons. Is it fair to say he’s chief among your musical influences? EE: Yeah. I think in certain ways I copy him and in certain ways I try to outdo him. I don’t want to just play folk music and the blues. I delve into other types of music: hard rock, ethereal music, even some electronic stuff. But as far as lyrics go and the overall objectiveness of my approach, I borrow that from Bob Dylan. Neil Young, too. AVC: Is there something that you get from Young that you don’t get from Dylan? EE: I don’t think Dylan had the sort of raw sincerity that Neil Young had. Dylan’s very detached from what he’s saying and sometimes almost too cool for his own poetics. In interviews, Neil Young talks about the fact that he loved Dylan and tried to copy that aesthetic too, but that his own identity—that honesty—pushed through. AVC: You’ve mentioned a slightly less obvious stylistic influence on the sound of Furr. What was that? EE: African music and dub. As far as rhythm sections go, that’s the ultimate. And even some of the music from parts of my culture, like cumbia and certain Southwestern sounds… it’s the real thing. Those are the rhythms of the universe.